World No. 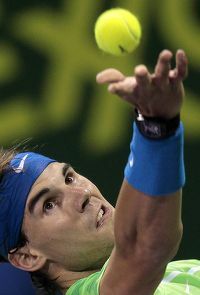 2 Rafael Nadal was forced to play three sets in his 2012 ATP World Tour season debut Tuesday, but came away with a 6-3, 6-7(2), 6-3 victory over Philipp Kohlschreiber in the first round of the Qatar ExxonMobil Open in Doha. 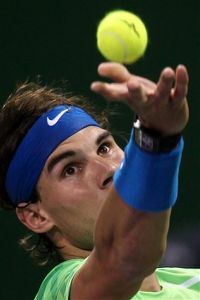 "I'm very happy about my level," stated Nadal. "I think I played a very good first set. The only moment that I didn't play well was the beginning of the second and after the tie-break. For the rest [of the match], I think I played solid." After winning the first set, Nadal fell behind 1-4 before winning three straight games to even the second set. The two battled their way into a tie-break, and it was Kohlschreiber who grabbed an early mini-break, closing the 'breaker out with ease to send the match to a deciding third set.